As I sit here and write this, I’m a bit exhausted. What a weekend! Nothing really spectacular took place, but I did have a bit of a cooking frenzy, preparing a feast on Sunday. Thinking about this focaccia makes me smile. You know when you follow a recipe and it works out so well that you feel amazing? I’ve still got that feeling 24 hours later. I think it’s more the art of making bread. Getting the yeast to activate, kneading the dough. In the end you have bread. It amazes me. I am more excited and happy when I make the basic things than when I cook tricky recipes. It’s the same feeling as when I made fresh pasta. I want to tell you about this focaccia, more so about the yeast. I’ve made recipes using yeast a couple of times, and in my experience, I’ve never been that successful at getting yeast to activate. It should be easy right? Yesterday it finally was! And my trick was putting it in a warm oven. Just warm enough that you can still touch the wire racks. Like 40°C warm. And then storing the dough in the same oven temperature to rise again. I love this. And then the yummy oil, rosemary and salt topping. I have this drinking glass on my windowsill that has fresh rosemary sprigs, well it was fresh weeks ago. It has dried out so nicely that they crunch when you eat them. 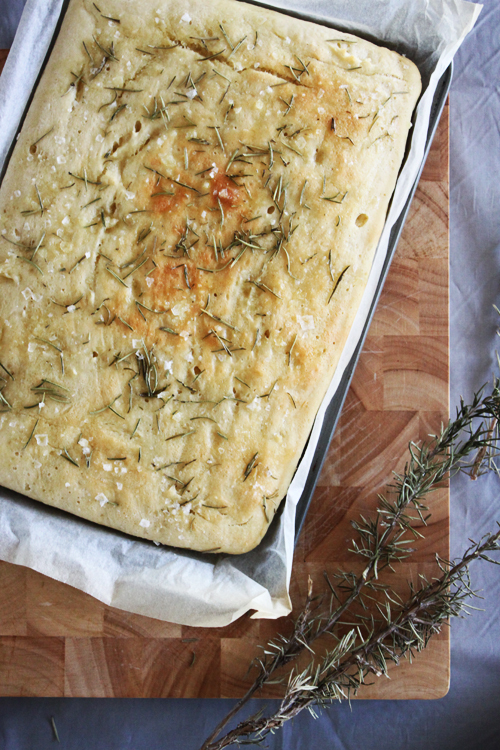 They worked perfectly on this focaccia. Ok so the recipe. It comes from The Food of Italy. I followed the basic focaccia dough recipe to a tee (except it had quantities to make two, I only needed one) and their recipe called for green olives as well. I just had a thought – garlic would have been amazing on top of this, mixed in with the olive oil. Basic notes to this one – use the best olive oil you can get (virgin, not extra virgin) and sea salt flakes. It will make a big difference. And another note, eat this the day you make it. Focaccia goes a big tough the older it gets, it's best eaten straight out of the oven. In a small bowl, add the sugar, yeast and 60ml of the warm water. Mix well and set aside in a draught free area for 5 minutes for the yeast to activate. I like to put the yeast mix in a warm oven (40°C) to ensure it activates. If the yeast does not activate, throw it away and start again. In a large bowl, add the flour, salt, olive oil, yeast and three-quarters of the warm water. Mix with a spoon to bring all the ingredients together. Add a bit more water at a time until all the ingredients are well combined and a solid dough starts to form. You may not need to use all the water. Lightly flour a clean surface and place the dough in the centre. Knead the dough for 8 minutes until it is nice and soft and elastic, and springs back when touched. Rub the inside of a large clean bowl with a little olive oil and place the dough in the centre. Brush the dough with a little olive oil and make a cut along the top. Cover the bowl with plastic wrap and a damp tea towel and place in a draught free area for 1.5 hours to rise. I like to place the bowl back in the warm oven. After 1.5 hours the dough should have doubled in size. Remove the tea towel and plastic wrap and push down to release the air bubble. Line a baking tray with baking paper and place the dough on the tray, pushing it out to the edges using your fingers. Cover the tray with plastic wrap and the damp tea towel and let it rise for another 1.5 hours in a draught free area (or back in the warm oven). After 1.5 hours the dough should have risen again. If you have used the oven to store the dough, remove now. 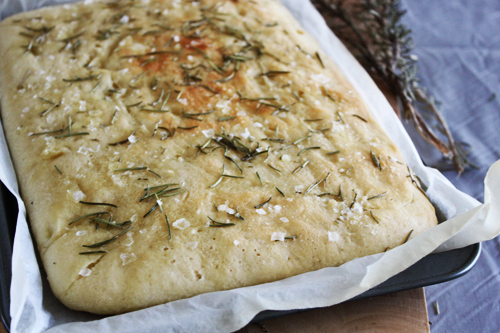 Drizzle olive oil on the dough (be generous) and sprinkle the rosemary and sea salt flakes. Place in the oven and cook for 20 minutes or until golden. Drizzle a little more olive oil on the focaccia (it will soak it up quickly) and let it rest on a wire tray. Serve warm. There's something really satisfying about baking bread. Particularly kneading it after a hard day. Looks delicious! Good enough to eat. This looks fab, I really like making bread. I think I'll have to make some this weekend! I've been dying to spend a day making bread...you have inspired me to do it tomorrow! Oh yum! That looks fabulous!! looks like a reasonably easy bread to make too! good use for my home grown rosemary too! Ooo I just love fresh focaccia. What a wonderful easy recipe! The stories behind your recipe are awesome before actually getting to the recipe. Bread baking is definitely an art, and you make it seem easy! The pictures you provide are engaging in me wanting to get up and make it right now! I'm excited to try this one and see if it comes out the same!